Our natural biases affect how we lead and who we follow. Understand them to sharpen your instincts and help you grow your business. The Fading affect bias explains that unpleasant memories fade faster than positive memories. The tendency to follow the "middle of the road" and avoid choices that are perceived as extreme. The tendency to assume one's thoughts are shared by others without direct confirmation. The tendency to believe that vague general descriptions are accurate depictions of one's personality. Arriving at different conclusions from the same evidence because of the way the evidence is presented. Funny things are remembered better than normal things. When learning something new, we tend to start seeing it constantly in our everyday lives. The tendency for one trait to color the way a person's other, unrelated traits are viewed. When people remember events as being more predictable than they really were. Creating a relationship between two concepts when no such relationship actually exists. The tendency to seek more information even after there is no more useful impact on the decision. The tendency to treat member of one's own group more favorably. People are more likely to believe a statement they have heard previously just because it's familiar to them. Leveling is the tendency to keep out or tone down parts of a memory to keep the recollection smooth. The tendency to hold a stronger preference for the familiar. The end of a presentation is easiest to recall, followed by the items at the beginning. Viewing pictures facilitate memory recall better than written word. The tendency to underestimate the time required to complete a task. We "average out" our memories and don't think of frequencies as extremely as they are. Self generated statements are remembered more easily. People remember things that they find relatable. Information provided over a longer period of time is better remembered. People tend to believe that others remember their thoughts or actions longer than they really do. The tendency to prefer current ideas and systems over adopting new ones. Including additional, irrelevant information at the end of a presentation. The tendency to evade questions that are deemed too personal or embarrassing. A cognitive bias is a tendency to remember something better or prefer one thing over another based on certain conditions. 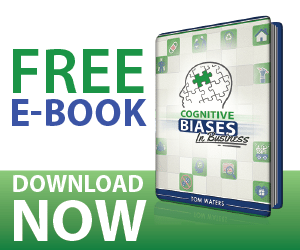 Whether you’re marketing, training, presenting, or buying, understanding these biases will help you make better decisions!